When she’s feeling sentimental, my Mum loves to tell stories from our childhood holidays in Italy. The tale of choice for my brother involves a restaurant laid out for a wedding banquet, an excitable two-year-old boy, a table cloth corner just a little too enticing not to pull and . . . well, you can probably guess the rest (except, perhaps, the part where the restaurant owners forgave the devastating mess, whisked my brother into the kitchen and onto the counter, then proceeded to feed him as my mortified mother finished up her meal. God bless the Italians). One of her favourite stories about me, again, takes place in a restaurant. As others around me perused the (no doubt lengthy and delicious) menu, I regally announced from my plastic high chair ‘Pasta coming, then chips, then ice cream’. Both stories set in Italy, both indicative in many ways of my brother’s and my different personalities (one a little bit mad but charming, one opinionated and ever-so-slightly demanding) and both focused (surprise surprise) on food. It was my great aunt who lived in Italy – and was most likely present at both the occasions above – who gave me my nickname of the little loaf. However looking at photos from the time, the little ice cream cone would have been almost as appropriate: most holidays filled with daily pit stops for a cone or two. Accompanying flavours might come and go, but looking at photos, chocolate would almost always feature: scooped into a cup or cone, smeared down my t-shirt and occasionally all over my face. Back in England, my favourite chocolate ice cream to eat as a child (yes, I’ve finally got to the point of this post) was the chocolate and vanilla bombe at Pizza Express. Nothing elaborate or expensive but part of a favourite weekend treat, served in a little silver bowl, accompanied by a cheap ice cream wafer and eaten so slowly that my whole family would start to despair about their chances of ever leaving the restaurant alive . . . This recipe is my attempt to recreate that childhood memory, updated with some slightly more sophisticated ingredients. I’ve been testing some recipes for Why Nut (more info on this to follow soon) and had a freezer full of incredible hazelnut ice cream to use up. Combined with chocolate it’s an amazing combination, but feel free to try any flavours you like in these lovely little bombes. Delicious eaten slowly, with a small spoon; pasta and chips entirely optional. This is less of a recipe than a technique, but I’ve linked to a few favourite little loaf ice cream posts in case you’re not sure where to start. These bombes are best made using ice cream fresh from being churned for the outside coating as it’s a little softer and easier to mould. Line a tray with parchment paper and place in the freezer. Remove after 30 minutes. Using a tablespoon, scoop eight small round balls of hazelnut ice cream onto your prepared tray. Freeze until firm, about one hour. In the meantime, churn your choice of chocolate ice cream according to the manufacturer’s instructions. Lay out eight individual dariole or pudding moulds on your work surface. Cut eight small rounds of baking parchment and place one in the bottom of each mould. Once the ice cream has churned, spoon a small amount into the bottom of each mould – about 2cm. 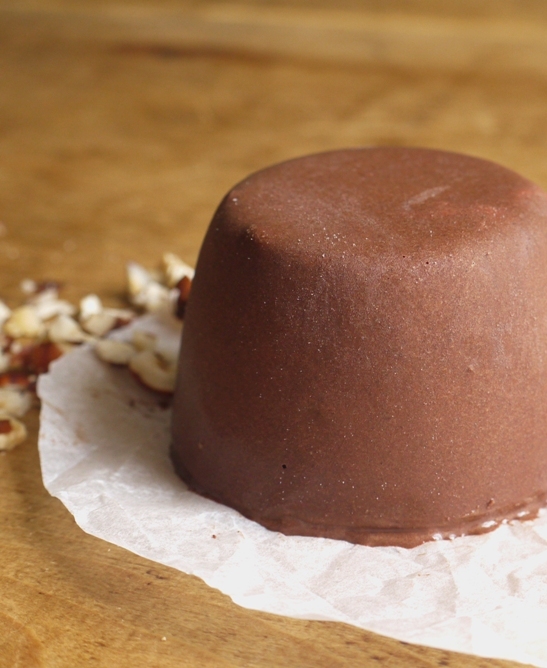 Remove the hazelnut ice cream balls from the freezer and place one in the middle of each mould. Top each ball with the remaining chocolate ice cream, allowing it to completely encase the hazelnut balls. Smooth the top of each mould with a knife, cover with cling film and freeze until firm, overnight if possible. When you are ready to serve the bombes, fill a bowl with just boiled water. One at a time, sit the bottom of each mould into the bowl for 30 seconds, wipe to make sure it’s dry, then put a small serving plate on top and upturn the mould. If your bombe doesn’t come out first time, dip it into the warm water again briefly. Remove the baking parchment hat (if it hasn’t stuck inside the mould anyway) and serve with a small spoon and a scattering of toasted hazelnuts, if you like. Nice story. I don’t remember the Pizza Express Bombe, but I love your recreation. I thought you did a chocolate shell from the clean look of it. I love that it’s just all ice cream! That looks amazing! I love the story too. My son is a huge fan of the meal at Pizza Express and I love that they aren’t too different from the adult meals. Such a lovely way to serve ice cream and chocolate and hazelnut are such a great combination of flavours! I like your story. I don’t feel like I’m on holidays unless I’m eating ice cream everyday! Wow, that looks amazing. So clever. This looks so unbelievably delicious! Oh yes, we have classic stories in our family as well, although yours could give ours a run for their money. The bombes are beautiful – perfect for entertaining! Love those stories – my mum says I would never let anyone have the Droopy rice topper from the Cartoonies cake mix! These bombes look amazing, love your pic where it’s just melting a bit. Very enticing! I re-created an ice cream from my childhood last summer and as much as I love having a recipe we love; I even more enjoy the people searching for the same thing that have found my effort…sort of coming full circle in a way! Your dessert is simple and beautiful; just the way I love them. This is awesome! Also, I love the flavors here…when we were in Italy the other week, hazelnut gelato and chocolate gelato quickly became my favorite combination. I love those stories about you and your brother! So cute and classic. 🙂 I’m pretty sure if this bombe arrived in front of me I’d want to stand on my chair and yell about it in excitement… even at 26 years old. 🙂 Yum! I wanna dive right in!! Ice cream bombs?! Whoa, these sound incredible!!! 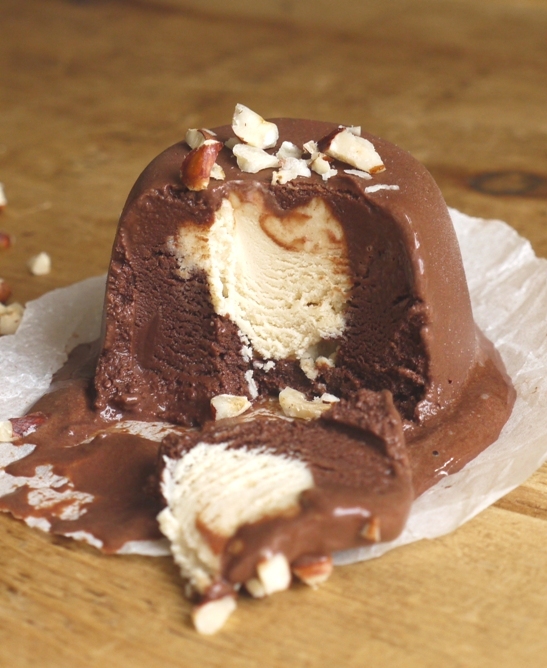 These ice cream bombes look amazing! I am swooning over here! 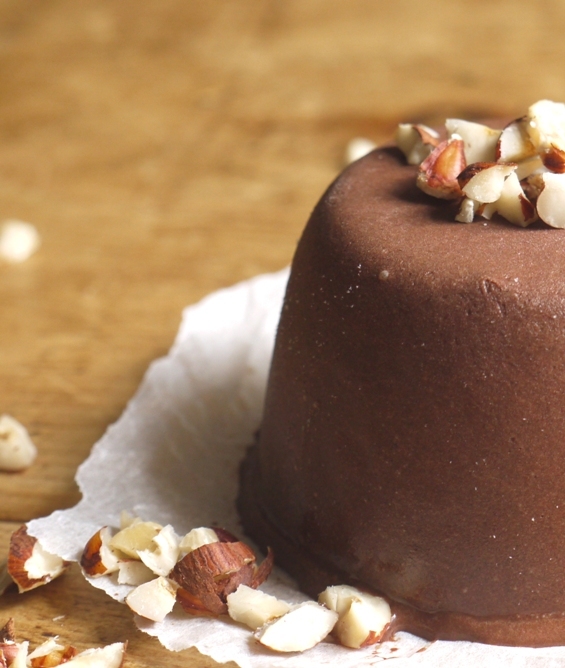 What could be better than a chocolate hazelnut bombe? Perfection. For a fast way to use up leftover ice cream (I know, a terrible problem to have), I make David Lebovitz’s tartufi. But this ice cream creation is a much more impressive treat! I like the flavor pairing you chose: classic and delicious. it looks delicious! anything with nutella flavors gets a thumbs up. beautiful pictures and it was a pleasure to read about your family stories! i am jealous that they happened in italy, possibly the best country in the med! I love your childhood stories. This is a perfect entertainers dessert and a combnation of flavours that is just too tempting. 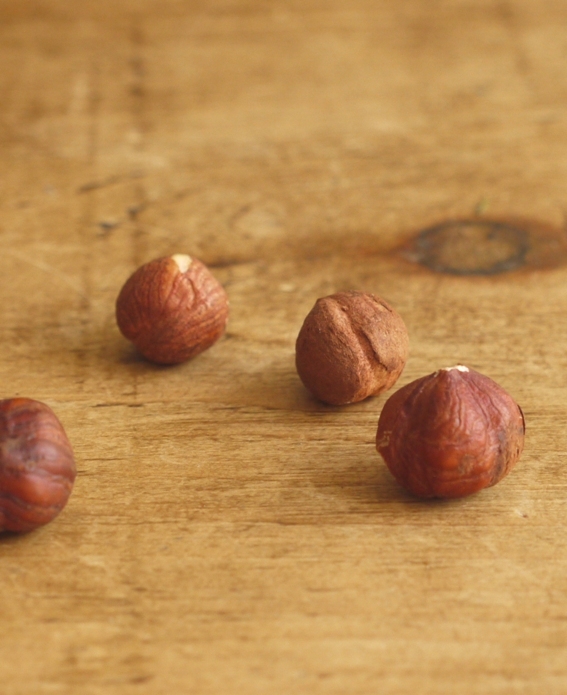 I have lots of hazelnut pste to use up…..maybe a post dedicated to you coming up. I love the idea of an “ice cream bomb”! This is definitely a great more adult version of the one you remember as a child. I have always loved bombe too. Putting this on my list of things t try. Wow, those bombes look amazing! I could have sworn from the photo it was coated in chocolate.I love how impressive this looks and how easy it is. 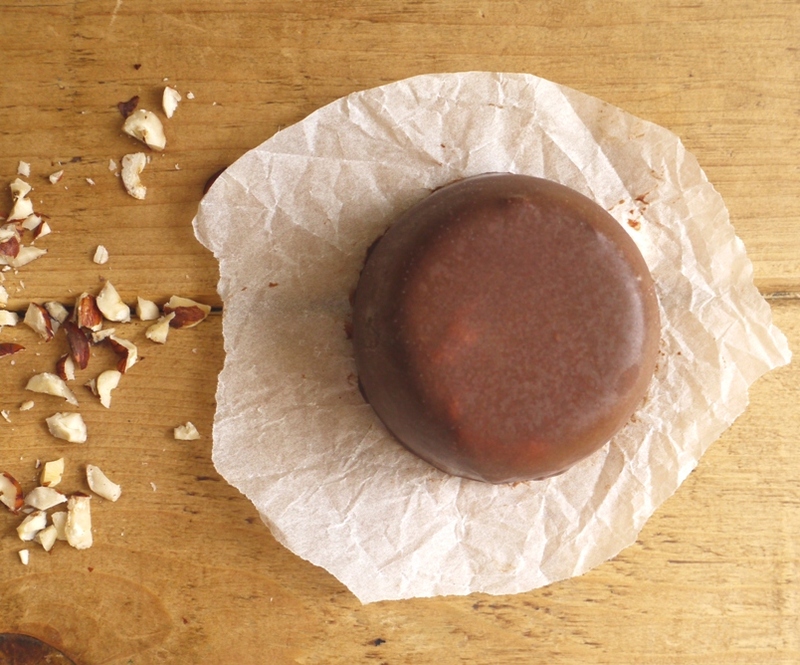 Talking about Italy, reminds of the ‘tartufo’ we both probably grew up eating during Italian summers, a special holiday treat. Yours, however, looks so much better!